Dolphins being slaughtered in Taiji Cove, Japan. Photo by Sea Shepherd. At least 250 dolphins have been tortured, many of them brutally killed, in Japan's Taiji Cove in the past seven days. Some of these mammals will be collected and shipped off to aquariums, but a large number will be harvested for their meat. Dolphin hunting is also known as drive hunting, and involves driving the animals together with boats and trapping them. It is increasingly seen as a cruel, inhumane, and entirely unnecessary practice. Now, animal rights groups and other activists worldwide are fighting back. 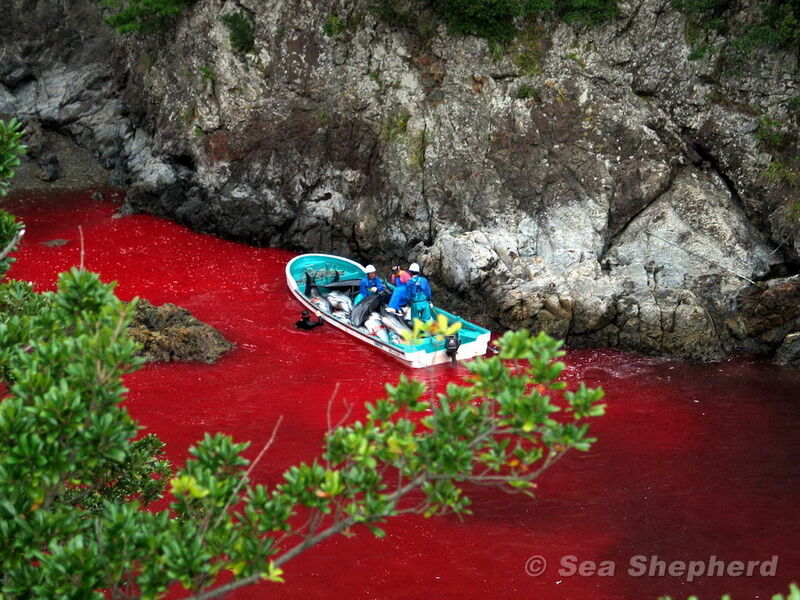 Several hundred bottlenose dolphins, porpoises, and pilot whales are hunted and slaughtered in Taiji Cove annually. Among those slain so far this year were infant dolphins (whom the fishermen view as too small to be worth much in meat), and a rare albino dolphin. On Jan. 24, activists held a rally in downtown Tokyo, decrying this abuse and calling on officials to stop the sale of marine animals to aquariums and as meat. They declared that the practice is tarnishing Japan's reputation, especially as Tokyo prepares to host the 2020 summer Olympic Games. "The government had argued that the practice of dolphin hunting is part of Japanese tradition and food culture," said Noriko Ikeda, a member of Action for Marine Mammals who organized the demonstration. "But the reality is that most Japanese people do not know about dolphin hunting, and it is extremely rare to find Japanese people who wish to eat dolphins. The real problem is that this hunt is driven by a demand for live dolphins from aquariums wishing to put on dolphin shows." Satoshi Komiyama, who is the leader of Action for Marine Mammals, noted that their group is relatively new, having arisen from a grassroots movement, and is indicative of a new uprising against these cruel practices. He remarked, "There have always been discussions about the pros and cons of dolphin issues in Japan. But arguments and discussions do not save dolphins. Now, we think action is important. Many foreign groups come to Japan and are active in protecting dolphins. However, since they are not permanent residents of Japan, there are various limitations and difficulties in regard to their activities here." If enough people protest, he remarked, "we have the potential to start a larger movement [based] right here in Japan." Animal rights and rescue organization In Defense of Animals added that not only is dolphin hunting a cruel sport, it is also unhealthy for people. "How the Japanese government can knowingly allow the human consumption of dolphin meat is beyond reason," stated the group. "It contains dangerous levels of mercury and other industrial pollutants." According to Carl Safina, Stony Brook University professor and founder of conservation group Blue Ocean Institute, it's notable that Japan's own slaughter guidelines for livestock are superior to that of the U.S.'s torturous factory farming, in that Japan requires animals to be killed in the quickest, most painless way possible, or else lose consciousness before being killed. Efforts must also be made to minimize anxiety and depression in the livestock. None of these guidelines, however, apply to whale and dolphin killing, and since 2010, a new, more vicious killing method has been employed, one which involves piercing the animals' spinal cords with metal rods. Essentially, this results in a more prolonged, painful death for these highly intelligent mammals. The reason for doing so is because it apparently shortens the "harvest time" and makes the job easier for the fishermen. The uproar over the slaughter has extended beyond that of mere animal rights and environmental groups: It drew a firm rebuke from U.S. Ambassador to Japan Caroline Kennedy, who on Jan. 17 tweeted, "I am deeply concerned by the inhumaneness of drive hunt dolphin killing. The U.S. government opposes drive hunt fisheries." And according to a report by Whales.org, "The treatment of dolphins in [these] hunts sharply contradicts current animal welfare standards employed in most modern and technologically advanced societies. The systematic mistreatment of dolphins, allowed and sanctioned by a highly developed country such as Japan, is in striking contrast to the European Union, the United States, and even existing Japanese livestock legislation."